For those of you who cannot wait (all two of you! ), I have made an early Release Candidate version of my new eBook available here and is currently at the reduced price of $6 (it will probably go up to $7 or maybe $10 soon though ;-). The current version of the PDF is rev.0.3 but it may be revised in the next week or so to correct any typos, so keep the link that is emailed to you by Payhip so that you can click on it again in a few weeks time to download a newer revision for free. This new eBook assumes that you are familiar with E2B already or that you have read the previous eBook. It does not cover XP installs. It is not yet 'advertised' on the E2B website as I want to get some initial feedback first, if possible. If you previously tried the E2B grub2 menu system but could not get it to work (e.g. no payload files were listed in the menus), then please try the new Beta9 versions. You will need to replace the old UEFI_GRUB2_PTN2_Beta8.imgPTNLBAa23 file with the new UEFI_GRUB2_PTN2_Beta9.imgPTNLBAa23 file. This menu system allows you to UEFI or MBR boot to a grub2 menu and then directly boot to a large selection of (mainly Linux) ISO files. It may be more suitable for linux users because you do not need to defragment the ISO files. and also makes use of a new grub4dos batch file farxml.g4b (find-and-replace in XML). You can download E2B v1.A1h here. It includes the new default background file. The first draft revision of the eBook #2 is entitled 'How to install Microsoft Windows using Easy2Boot' and mainly deals with the various scenarios for installing Windows 10 from E2B. It goes into some detail about the Windows Setup stages and XML configuration files, as well as how to automate a Windows 10 build. Windows XP is not covered. It's that time of year when E2B has a default background change. By using the AOMEI Windows PE Builder (free 30-day trial version), we can quickly build a useful 32-bit or 64-bit WinPE ISO in just a few minutes and with just a few clicks. Note: I recommend building first the 32-bit ISO because the 64-bit version will not contain WoW64 and so will not be able to run 32-bit applications such as PortableApps (but you can add Desktop shortcuts to 32-bit and 64-bit apps in the \AIO folder using PEStartUp). Also, because the WinPE has no added extra Windows components, some added portable applications (such as Chrome, Opera and Mozilla, etc.) may not run correctly (e.g. 'couldn't load XPCOM' error). The provided QtWeb browser Desktop link does work however. JFX's WinNTSetup.exe Windows utility can be used to install Windows directly from a Windows Install .ISO or .WIM or .ESD file. You can format existing partitions first using the 'F' button, but if you want to delete\make partitions, you had to run Diskpart manually first. WinNTSetup does also support command line switches too, so you could use it to automate a Windows install using a diskpart script and then run WiNNTSetup.exe with some command line parameters. One advantage of using WinNTSetup instead of Windows Setup is that you can install a UEFI-enabled version of Windows from an MBR boot, you can also install a 64-bit UEFI version of Windows onto the target hard disk even if you are booting from a 32-bit MBR system, e.g. 1. Boot to WinPE 32-bit (I use a Windows 10 install ISO on E2B and hit ENTER to run it in 'Repair' mode). You can also boot to WindowsToGo or some other WinPE instead. 4. Run WinNTSetup (32-bit version) from the E2B USB drive, select any ISO from the E2B drive (from any folder or partition), select the Windows Edition and target disk volumes and then install Windows. 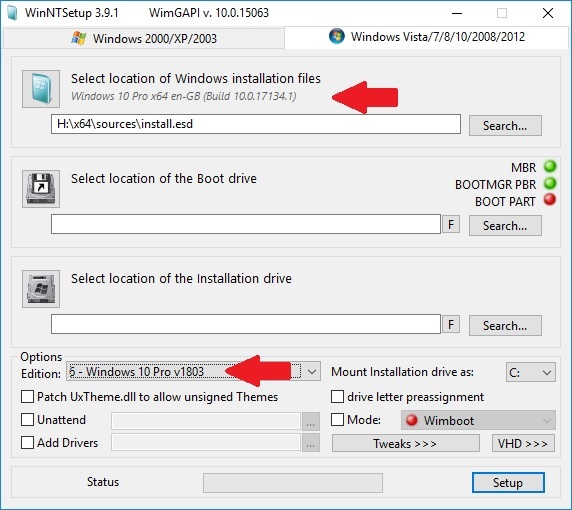 You can instruct WinNTSetup to install for UEFI or MBR booting or both (or ask it not to install any bootmgr boot code). Note: You can also specify an XML file (e.g. SDI_CHOCO XML file) and tweak some Windows settings using WinNTSetup, but note that if you use an XML file, the Edition that is installed (Home, Pro, etc.) is determined by the setting in WinNTSetup and NOT the XML file - so make sure you set the Edition that you want to install in WinNTSetup's 'Edition' drop-down list before you click on the 'Setup' button! For a 2-week period, Brett Shavers is offering us his X-Way Forensics course for $29.99. Play the introductory videos (click on the Introduction link on the right-hand side of page for a 2nd video) to learn more. Note: I have not personally taken the course myself. I am just bringing this special offer to your attention. If you have followed the course yourself, please let us all know what you thought of it. This version now allows the user to add a \_ISO\WINDOWS\WINAIO folder which can be used to hold Windows All-In-One Install ISOs and .imgPTN files. v1.A1g with improved language files + tweaks + Server 2016 hotkey changed from 6 to D. Some .hdr files now removed and MenuWinInstall.hdr added. As using AIO ISO files can be unpredictable, if you find that they don't work, then you should convert them to .imgPTN files. Note that the Menu entry and Menu Heading for the new WINAIO folder has been added to each of the STRINGS.txt files. If you want to change these entries, create a new language folder and change the LANG variable to your new language (e.g. ENG1). Please let me know if you spot a bug! Added \_ISO\docs\Multiple Backgrounds folder - read the ReadMe.txt file and use the ready-made files included. Menu wallpaper files which are automatically used as wallpaper file can now have .jpg file extension as well as .bmp, e.g. \_ISO\WIN10.jpg, \_ISO\DOS.jpg. PimpMyDrive.cmd now adds Adjust_E2B_Menu.mnu - some of the other menus are now not added to make the Main menu tidier. SUB_MENU_Maker.cmd file also added to into the \_ISO folder for user convenience (same file as \_ISO\docs\E2B Utilities\E2B SUBMENU Maker.cmd). PatchMe script updated to suppress the 'A20 Debug' message on bootup. .bat, .xml and .bak files are now ignored if they are in a menu folder. .jpg and .bmp files can be placed in menu folders and they will be loaded as background wallpaper when selected by user from the menu. The 'How to make a multiboot USB drive using Easy2Book' eBook has proved far more popular than I ever imagined! I thought that it might have interested only 10-20 people at most, but since mid-June I have now sold over 100 copies which really surprised me, but it's very nice to know that all my efforts were worth it! The 130pp book took me over 3 weeks from start to finish (sometimes with a 12-hour day and some weeks were 7-day weeks!). After writing the first draft, I carefully followed all the exercises myself to look for any problems in the instructions and I also added screenshots and diagrams. Glen kindly proof-read many drafts and final revisions and since then I have updated and improved the PDF - the latest version is now v2.3. However, I have had very little feedback on the eBook, so maybe nobody has actually read it yet or they fell asleep trying to read it! If you still have the original receipt email from Payhip, you can re-download a later revision of the PDF for free (contact me if you have problems). If you would like a version in ePub (.epub) form for your eBook reader device, please contact me. I do have a .epub file of v2.3 but it is not quite as nice as the PDF due to the limitations of the epub format. I am now thinking about writing another E2B eBook and there are a number of possible topics, three of which are listed below. Adjust_E2B_Menu.mnu has been improved so it is now loaded as a separate menu. PimpMyDrive.cmd now adds Adjust_E2B_Menu.mnu to the PIMP folder. E2B now automatically looks for menu wallpaper files for each sub-menu (see below). Now you can just add .bmp or .jpg files and they will automatically be used for the background image for that menu - no .mnu files are required.